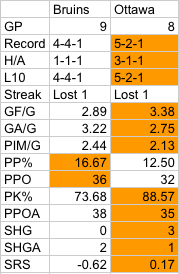 A win tonight could get the Bruins into the division lead 10 games into the season. 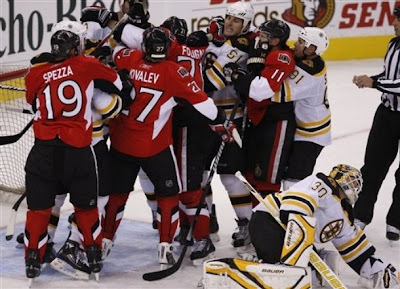 Ottawa's got Boston fan favorite Alex "lazybones" Kovalev. Remember that picture from the preseason? Yeah, not happening tonight since Lucic is out. But Thornton might be back and he's always good for a scrap. So who knows what's going to happen. I'm pretty much happy with whatever we can get this month. Let's beat ottawa and score a million goals so we lead the division, why not? So we're all in agreement then. Fantastic. Be sure to click the links on the right-hand side of your radio dial for other previews around the (B)logosphere, they're writing some good stuff out there. Milan Michalek has a hat trick already. Sheesh.